Wall Closure: 17.5 in. x 6.5 in. x 14.5 in. The Cardinal Health In-Room SharpSafety Locking Wall Cabinet is a piece of equipment compatible with a hand full of specific sharps container that is made for the purpose of holding sharps containers at a level risen up and off from the floor which can be dangerous when working in a medical facility such as family clinic or pediatric office where kids can sometimes wander off - this helps keep sharps items away from reach of these younger patients. The Cardinal Health 85301h Cabinet Enclosure includes a few features that make it a great option for many facilities. The first and most important feature is the locking ability of the wall cabinet. 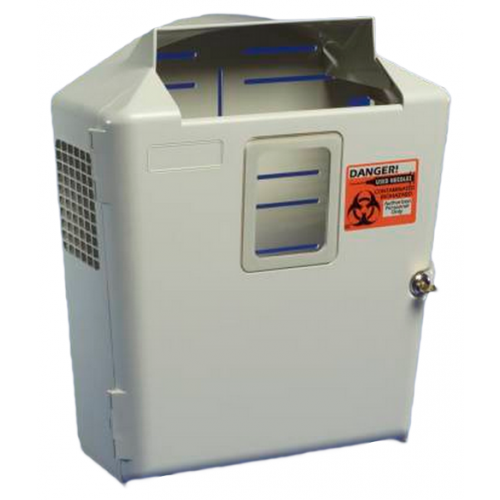 With this, you can keep your sharps containers safe and from being removed either accidentally or purposely. The wall cabinet is compatible with a couple of sharps collectors such as the 8536SA, 8537SA, 85221, 85221R, 8527R, 8533SA, 8534SA, 85321, and 85321R which are offered here. 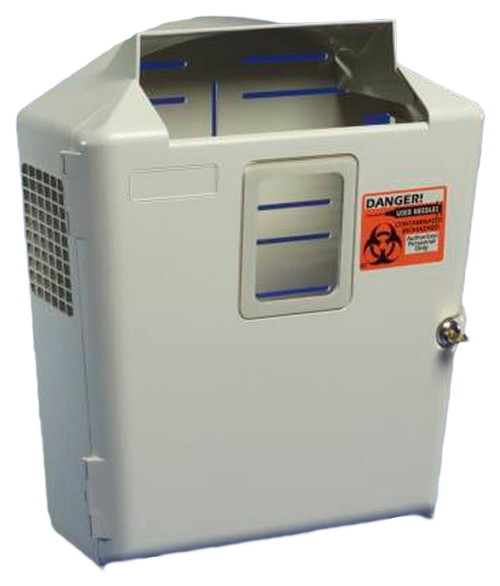 The In-Room 2 & 3 Gallon SharpSafety Wall Enclosure can be mounted on most any wall to keep from being on the floor. When mounting the wall cabinet, it is important to keep the height at a considerable range for staff so they can properly dispose of sharps items without having to reach extensively which can result in injury. Keeping ambiance in mind, the ivory colored plastic base is designed this way to match your office decor, keeping those translucent red and visual of used syringes and IV lines from dripping blood within the container.